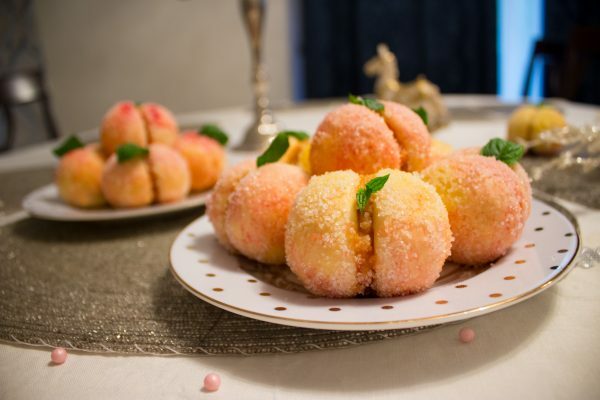 The Romanian dessert called mucenici is always prepared for March 9, when we celebrate our traditional Christian holiday, the feast of the 40 Martyrs of Sebaste. The 40 Martyrs referred to a group of Roman soldiers who were condemned to death in 320 for not wanting to give up their Christian religion. 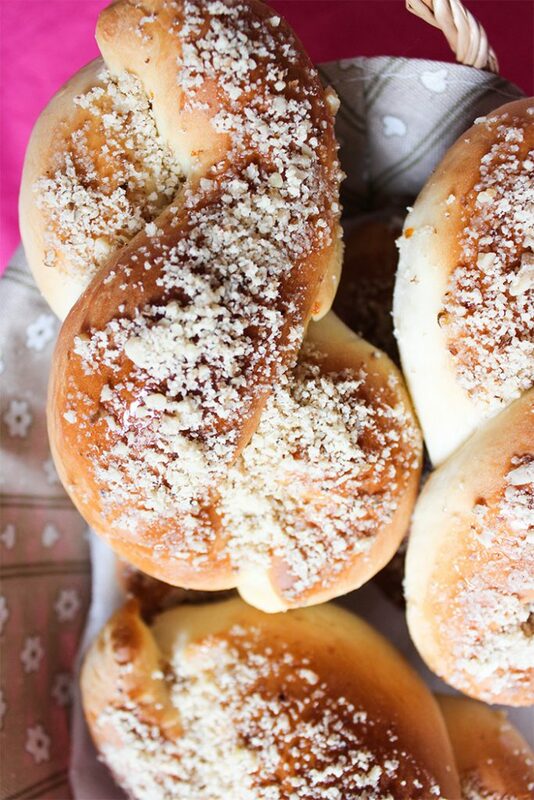 The martyrs were left in a prison for 8 days – that’s why we make mucenici in the shape of number 8. Since the soldiers didn’t give up their beliefs, they were forced to sit in a frozen pond on a cold night, but in the morning, they were all alive. It is said that during the night, great miracles happened: the water became warm, the ice melted, and 40 shining crowns descended over the soldiers’ heads. The soldiers were all killed during that same day, but their loyalty and courage were never forgotten. 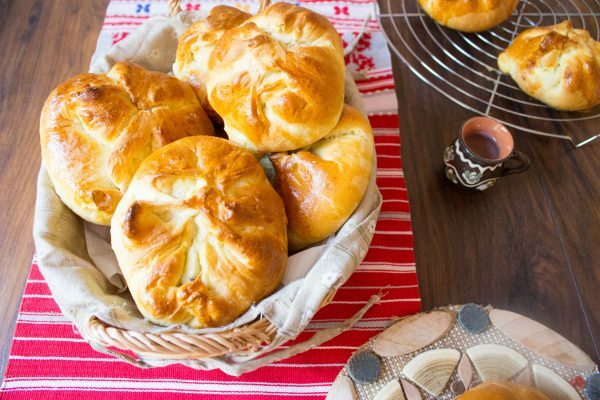 In their memory, we prepare these baked sweet breads, which are more popular in the Moldova region. 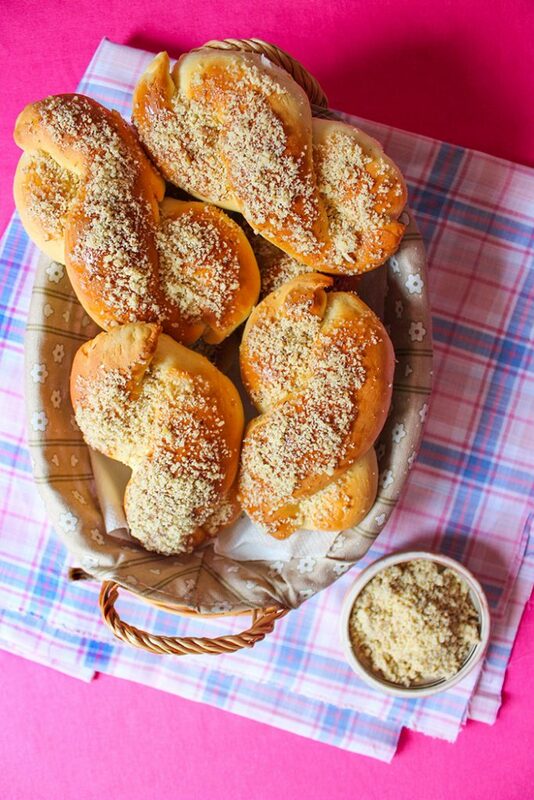 In Bucharest, my hometown and the capital of Romania, we usually prepare boiled mucenici, with a liquid syrup that contains ground walnuts. 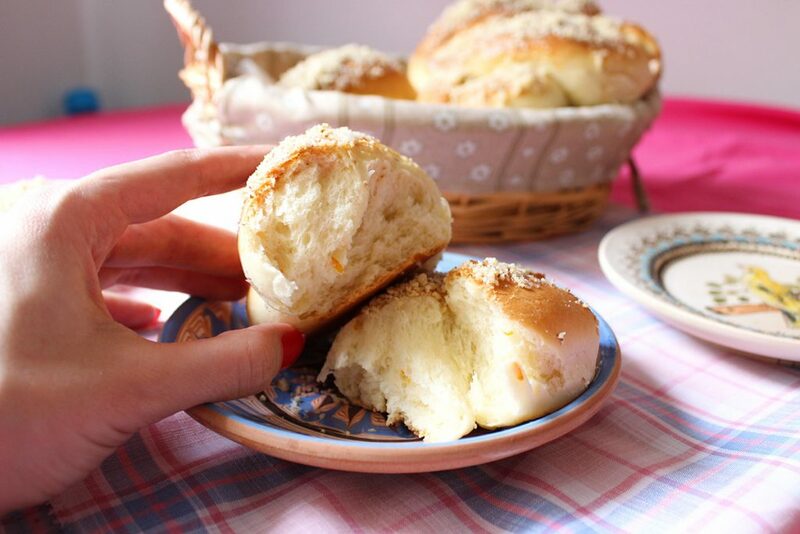 I wanted to make the baked version of Romanian mucenici this year – they are basically a sweet bread, flavored with a bit of orange zest, and topped with honey and walnuts. 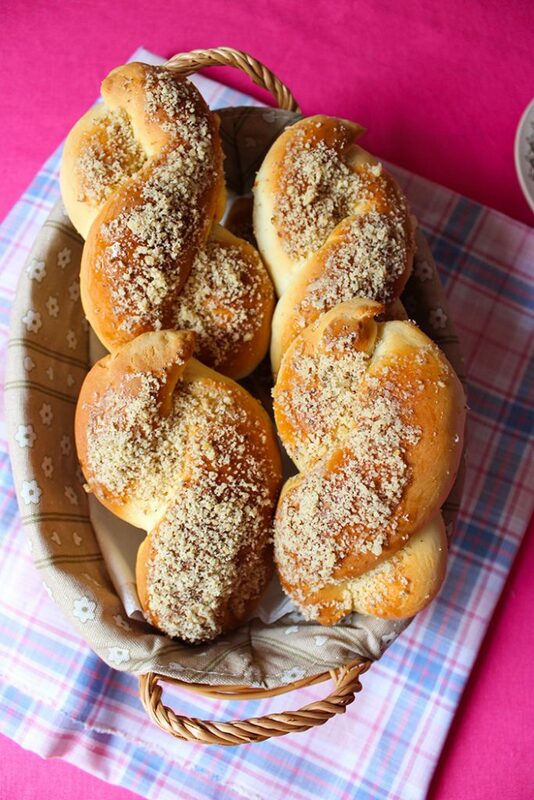 They are fluffy, not too sweet, perfect for breakfast with a glass of milk. 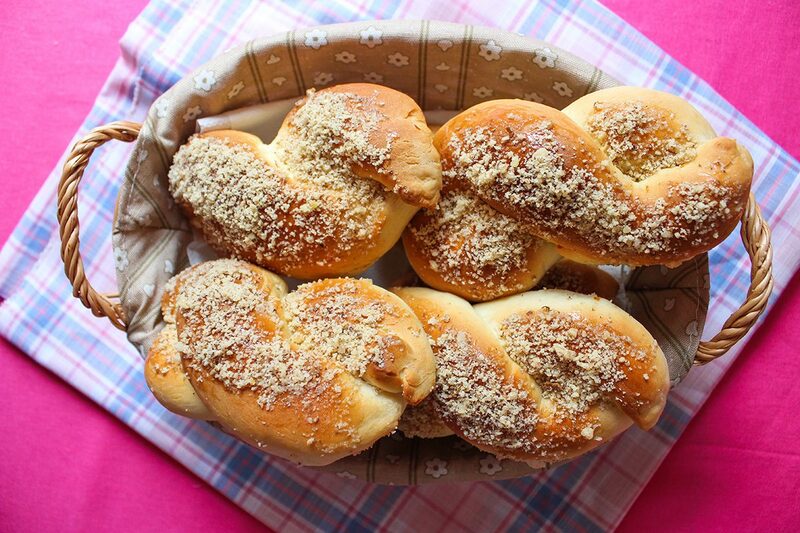 During this time of the year, many Christian Orthodox people choose to fast. 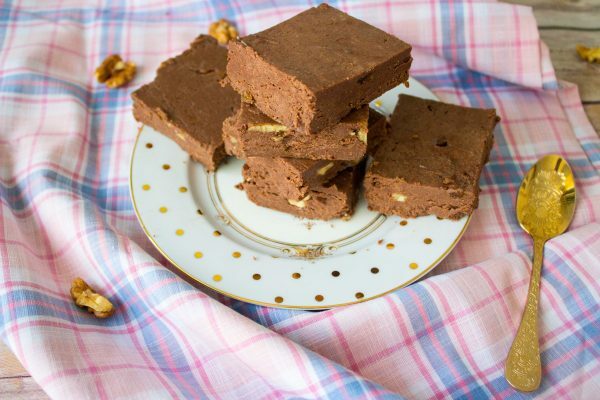 Fortunately, you can modify this recipe to make it suitable for the fasting season. Just substitute the regular milk with some warm water or soy milk, and it’s all good. Make sure that when you dissolve the yeast in the milk/water, the liquid is not hot! It should only feel warm to the hand. Be careful not to add any salt over the yeast and milk/water mixture – the direct contact between salt and yeast will significantly reduce the yeast’s growth rate. Warm the milk and dissolve the yeast in it, using a spoon. Make sure your milk is warm, not hot. In a bowl, sift the flour, make a hole in the center with your fingers, and add the yeast and milk mixture. Add the oil, the sugar, and the orange zest. With a spoon, mix the ingredients. When they are combined, add the pinch of salt and start kneading the dough until it becomes elastic and not sticky. Form a ball and divide it into 12 equal parts. With your hands, shape each ball into a 20-cm rope. Seal two ropes together at one end, then make an 8 shape by placing one rope on top of the other and sealing it at the other end. Repeat with all the remaining dough. Let the mucenici rise for 1 hour. Preheat the oven to 180°C (360°F). Bake the sweet breads for 15 minutes. After 12-13 minutes, keep an eye on them, they get burned easily. Take the mucenici out of the oven. Warm the honey on low heat until it becomes liquid, and then brush each of the sweet breads with some honey. Top them with plenty of ground walnuts. Enjoy! I’m going to try this today for my Romanian boyfriend! 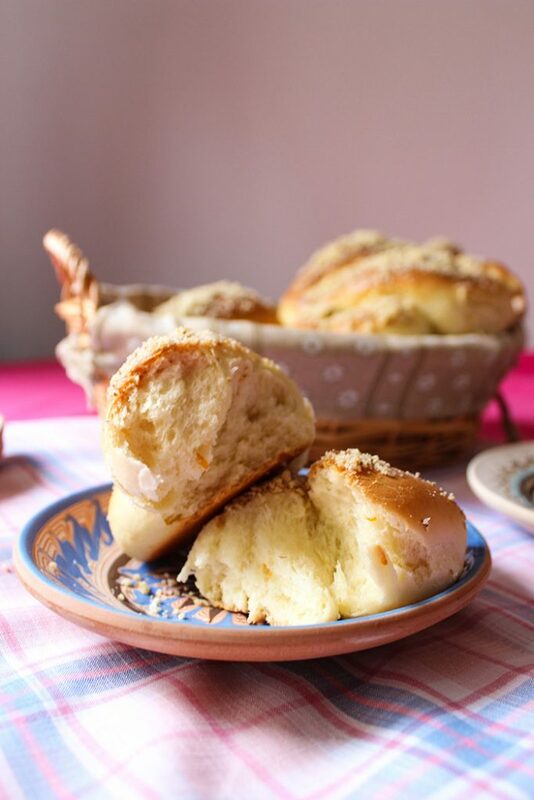 Do you have any hearty bread recipes, not sweet ones? He is from Orsova and enjoys a more dense bread than we have here in the states. Thank you!